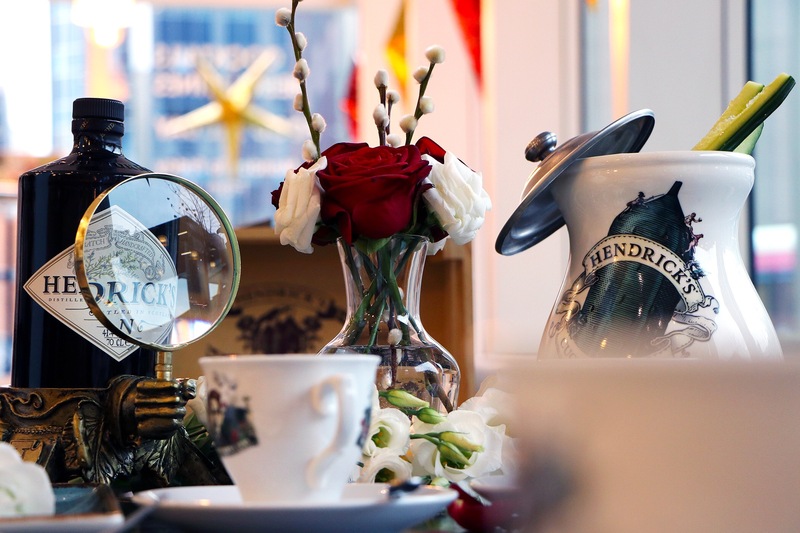 An Afternoon of Hendricks G& Tea at Bar Opus. 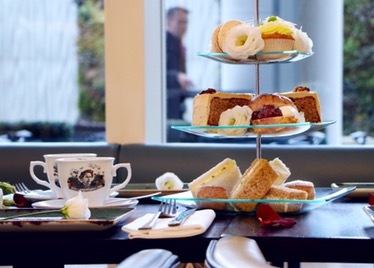 If like me you love afternoon tea, then this deal is for you. If like me you love Gin then this deal is the ideal after Christmas treat we all need in January. 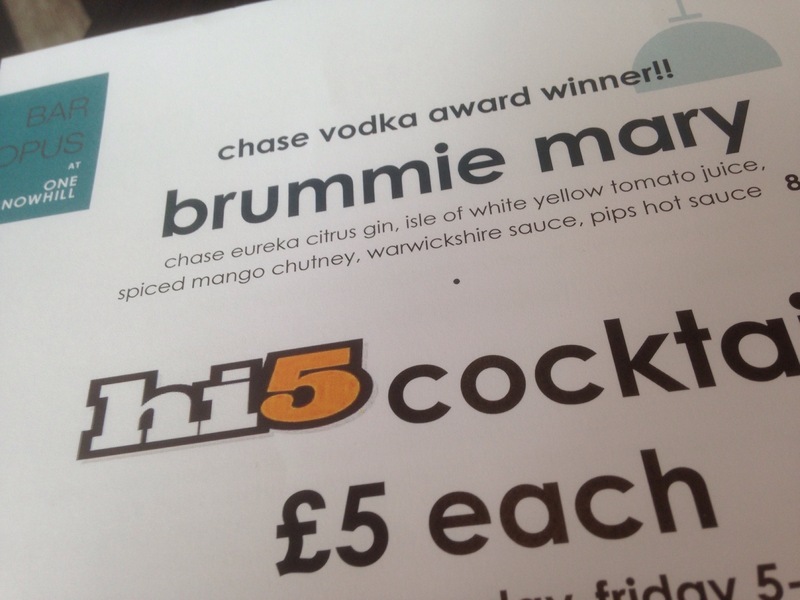 Bar Opus is one of Birmingham’s best city bars, have teamed up with premium gin makers Hendrick’s. 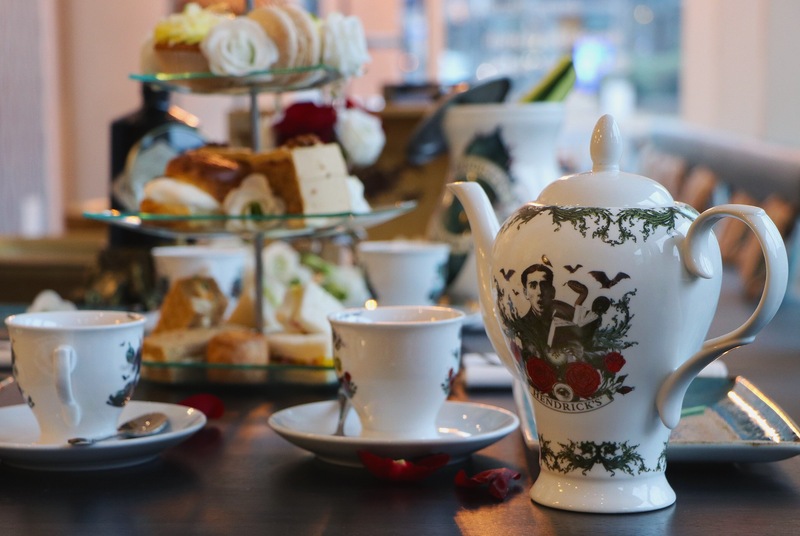 To celebrate everyone’s love of Afternoon Tea, and one of the finest gins in the world, the collaboration has been created to combine two very British lifestyle staples and create an experience for everyone to enjoy. There will be three choices of delicious Hendrick’s gin based cocktails served in the Hendrick’s ‘Vintage t-Pot’: the Flora Dora, which mixes lime, raspberry and ginger beer; the fruity Chelsea Rose, which infuses apple, raspberry and lemon or the herbal Martinez with its orange bitters, vermouth, maraschino. 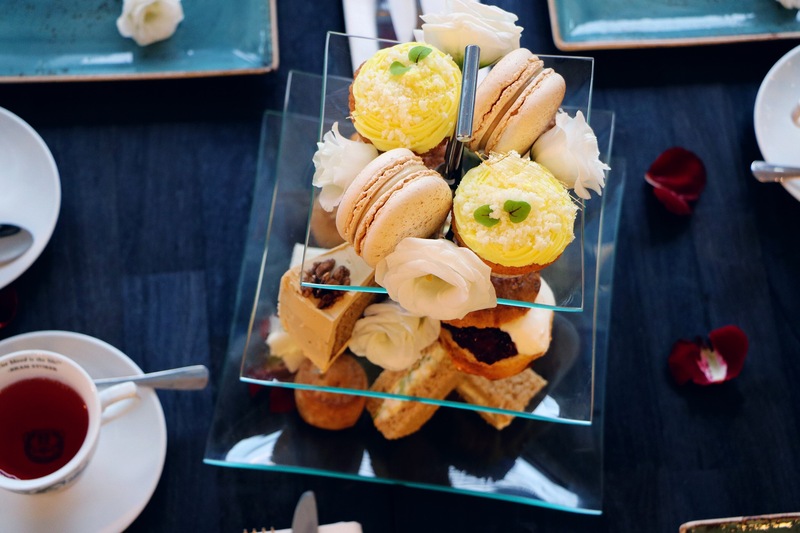 This uniquely British experience also features a delicious assortment of homemade savoury quiches and sandwiches and sweets of scones, macaroons, lemon drizzle cupcakes and a coffee & walnut cake. They also have a completely Vegetarian option as well. 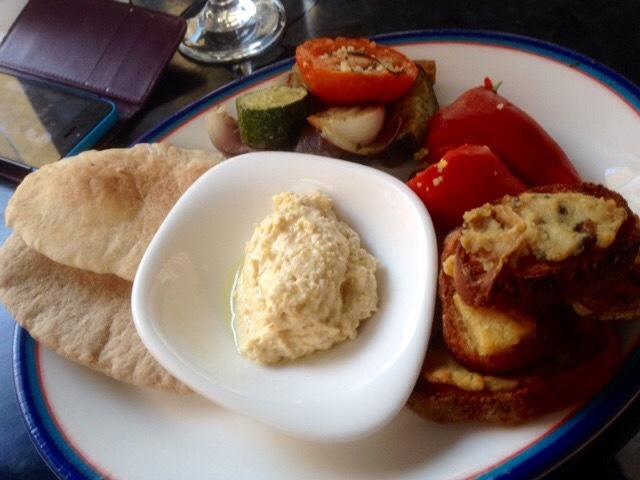 Humous and Red Pepper Pitta. 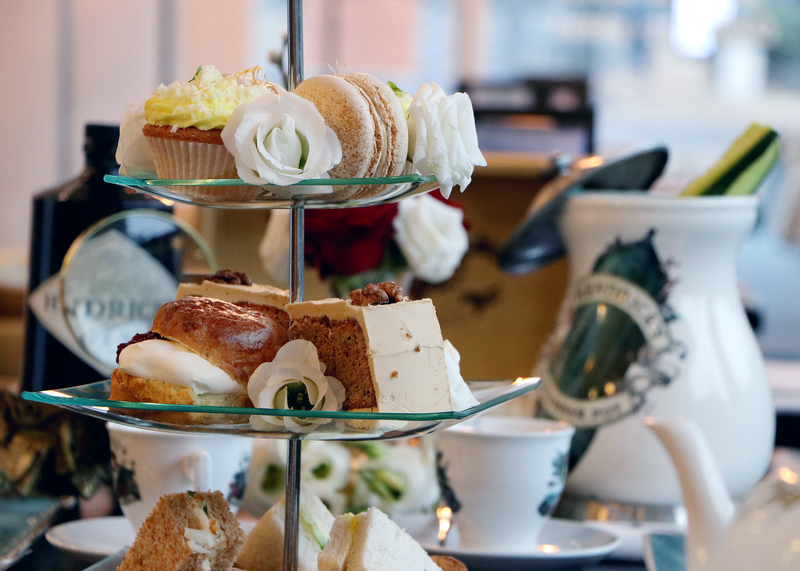 Hendrick’s premium Gin which was described by the New York Times as “the finest gin in the world is distilled and bottled in Girvan, western Scotland and will be served alongside the tasty treats to compliment. 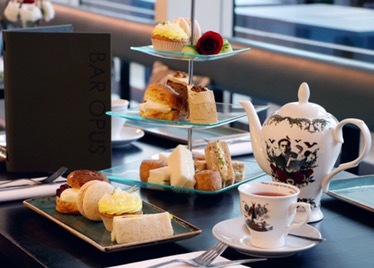 The unique experience is £50 for two people and is available every Saturday from Jan 7th at Bar Opus from 2pm to 6pm. As well as this, from January, every first and third Saturday, they will be hosting Live Music featuring local talent courtesy of EQ Music from 6pm to 8pm. Sounds a lovely new year treat. All images courtesy of Bar Opus and Clive Reeves PR. Bar Opus Christmas cocktail making videos. 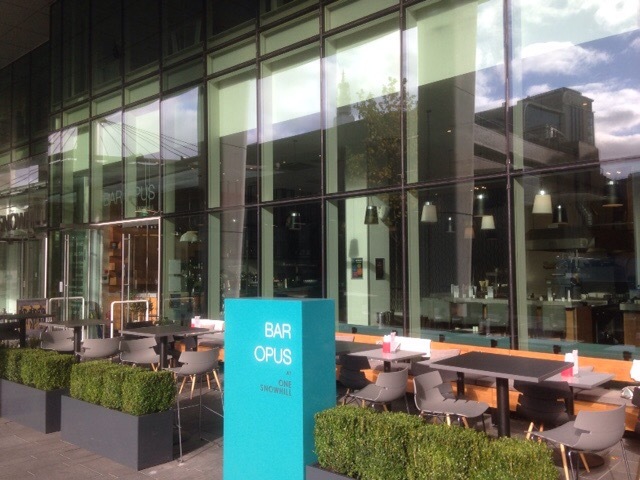 Bar Opus is one of the best places to drink cocktails in Birmingham. 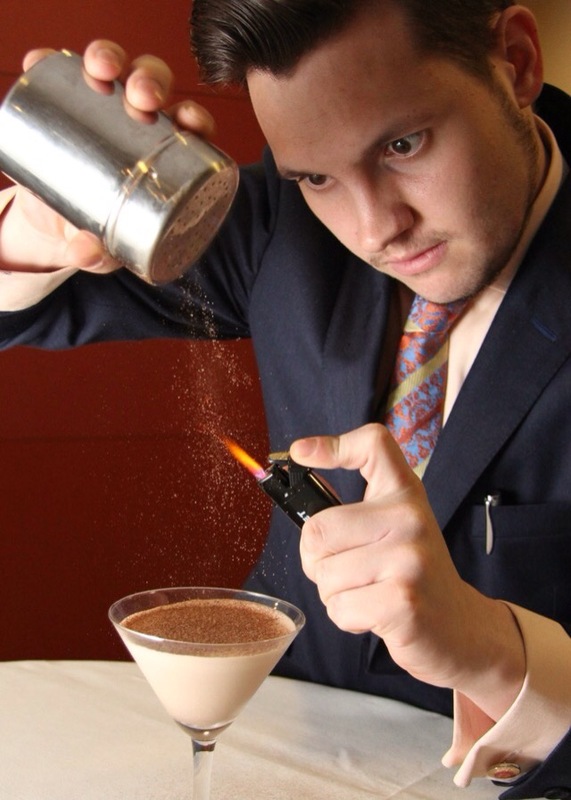 Classic cocktails are served along side some innovative concoctions using the freshest ingredients. To countdown to Christmas, and to celebrate the unique Christmas cocktails that Bar Opus will be serving over the festive season, the team have made a series of videos showing how people can make their very own Bar Opus cocktail at home! Or at the very least enjoy them in the bar over the Christmas period. Sam Cross Photo courtesy of Bar Opus. To see the videos, please click on this link underneath the cocktail. Smoking Monkey Sharer: £25, serves four: Monkey shoulder, smoked ice tea, cherry, citrus fruits. 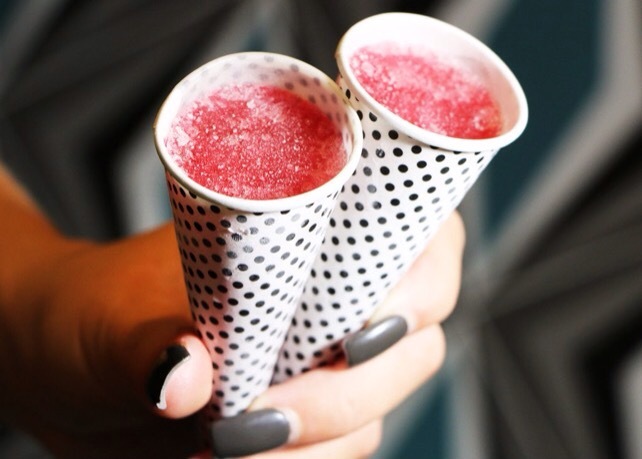 Frozen Candy Cane Kallipo – £6 for two: Peppermint, Burgal blanco, strawberry, Cranberry. Frozen Kallipo Photo courtesy of Bar Opus. Spiced toffee Apple cocktail – £5, serves one : Stoli salted karamel, gingerbread syrup, apple juice. The countdown to Christmas begins. Thanks for reading and hopefully I’ll get the chance to try them myself. You can purchase cocktail making classes gift cards via the Opus Website. 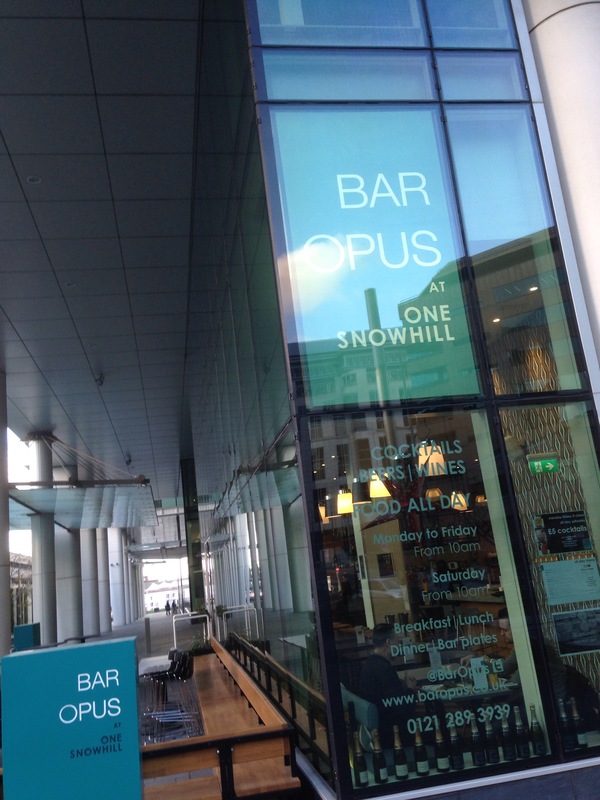 Bar Opus is at one SnowHill, Queensway, Birmingham, B4. 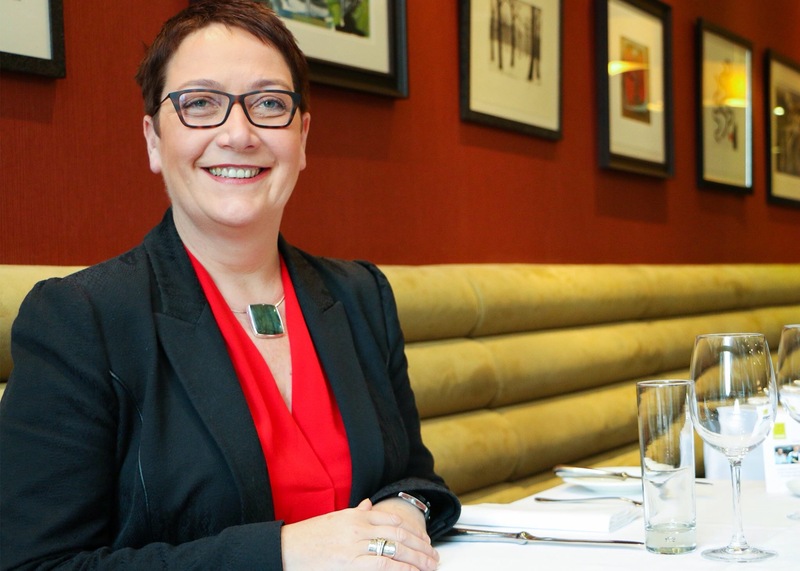 Birmingham restaurant director receives prestigious membership at leading hospitality association. 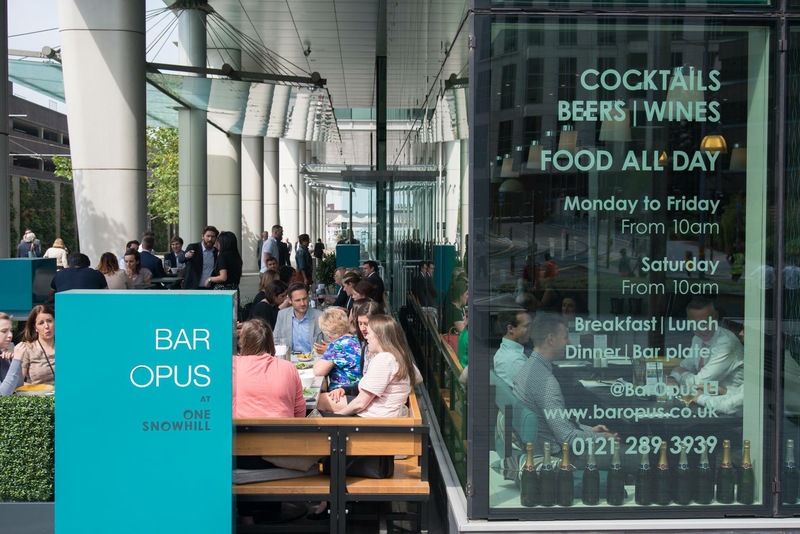 Birmingham City-centre restaurant, Opus is celebrating another fantastic achievement after one of its directors was awarded the prestigious role of academician at the Royal Academy of Culinary Arts (RAOCA). 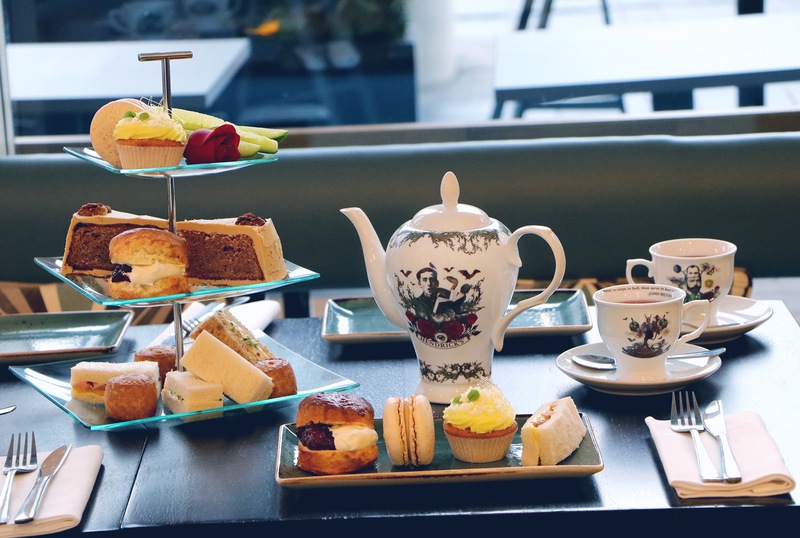 Irene Allan director at Opus at Cornwall Street, Cafe Opus at Ikon and Bar Opus at One Snowhill, was presented the outstanding membership earlier this month (November) following a rigorous application and interview process. She is the fourth hospitality professional from the city to take on the role, joining Glynn Purnell from Purnell’s and Luke Tipping and Andreas Antona from Simpsons. With an aim of raising the standard of the hospitality industry as well as inspiring the future generation of restaurant professionals through education, training and recognising and rewarding talent, the RAOCA is the UK’s best and leading professional association, whose members include the country’s top head chefs and restaurant managers. To achieve the esteemed role of academician within the association, applicants must first be nominated by three current RAOCA members, before completing an application stating the unique attributions they can bring to the association as well as partaking in an intensive interview. Through initiatives such as working with the University College Birmingham to offer the ‘Opus Scholarship’ programme, achieving the highest possible accolade from the Sustainable Restaurant Association, and adopting a school to educate pupils of the importance of food knowledge, Irene has demonstrated an exceptional skill set in raising the standards of the catering sector by sharing her wealth of knowledge and skills with the younger generation. She has mentored a number of her staff through to achieving awards of excellence in their careers. I want to congratulate Irene personally on her wonderful and much deserved achievement and thank her for the support of my blog. Opus leads the way on sustainability. Opus has been named the most sustainable independent restaurant group in the Midlands by leading organisation, the Sustainable Restaurant Association (SRA). The restaurant family, which includes Opus at Cornwall Street, Cafe Opus at Ikon and Bar Opus at One SnowHill was named a ‘Three Star Sustainability Champion’ by the SRA, the most prestigious and highest possible rating a restaurant can achieve, and it is the only independent restaurant group in Birmingham to achieve the accolade. From achieving its highest rating yet of 82%, the restaurant group is now in the top 9% of SRA members. The SRA, a not-for-profit organisation which encourages restaurants to improve its social and environmental impact, awards One, Two or Three Stars depending on how a restaurant rates against the three pillars of sustainability – ‘Society’, ‘Sourcing’ and ‘Environment’. Opus achieved exceptional results, ranging from 90% – 100%, for sourcing local, seasonal and ethical food, through a sustainable supply chain, for being highly committed to community engagement, responsible marketing and treating people fairly. 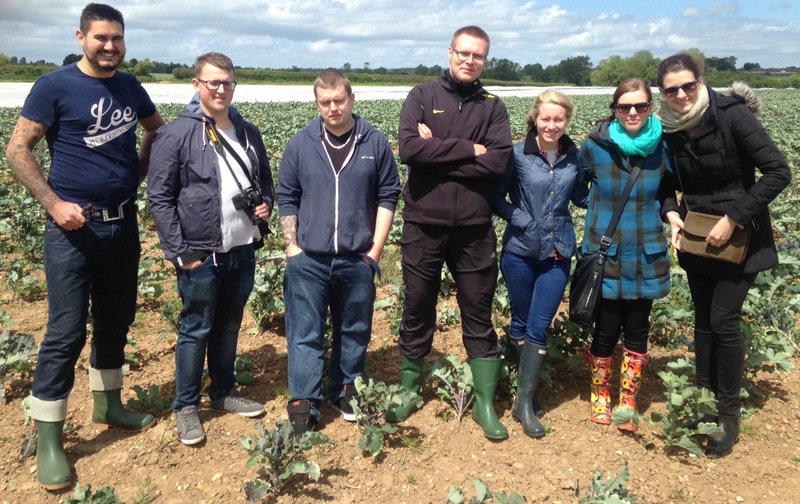 Fuelled by a passion for fresh British produce, Opus is fully committed to an ethical approach to sourcing. 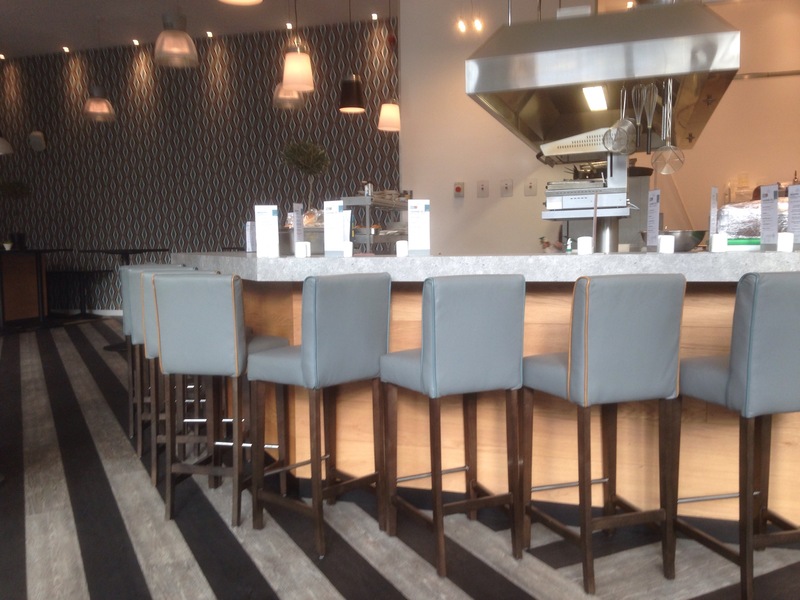 The menus are ingredient led and at its Cornwall Street restaurant, they are freshly-written each day. Through its unique ‘Source Dinner’ series, Opus connects the diner with its family of farmers and suppliers, allowing them to hear their compelling stories and see first-hand the passion they put into raising their quality produce. Executive chef, Ben Ternent, has handled the sourcing of produce since April 2015 and it is his uncompromising stance on only using strictly market fresh, seasonal ingredients and free-range livestock that has made Opus the most sustainable it has ever been. “Frankly, it’s all about the ingredients that you start with. 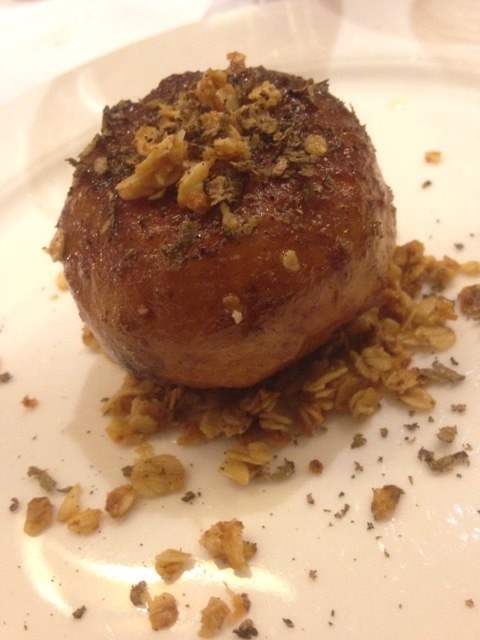 There is a definitely a direct connection between ethical, quality sourcing and the delicious flavours on the plate. My team love the sourcing side and get fired up by meeting the farmers and visiting the farms – they take real pride in the produce,” Ben said. This outstanding rating from the SRA is not the first success for the Opus group this year. 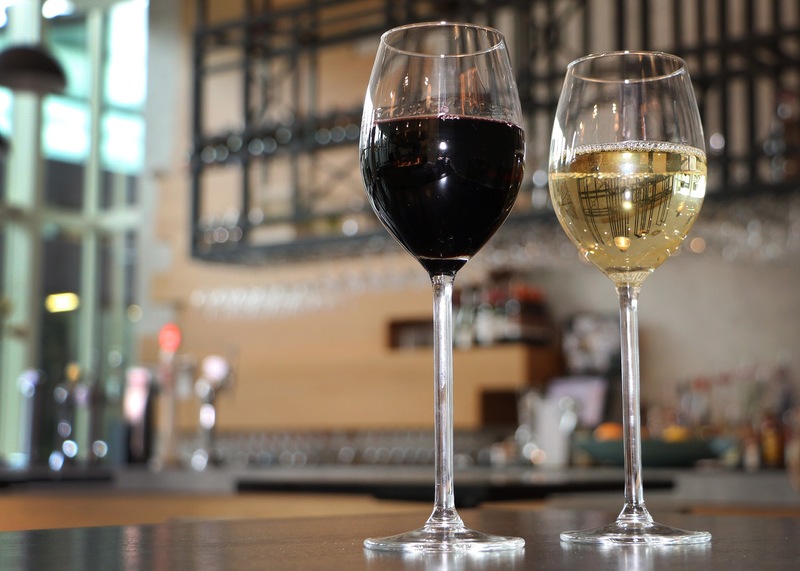 2015 has seen Opus at Cornwall Street celebrate its 10th birthday, going from strength to strength even through a difficult recession, Cafe Opus at Ikon was recently named a ‘local gem’ by The Good Food Guide 2016 and Bar Opus at One Snowhill continues to push boundaries with innovative and award-winning cocktails. 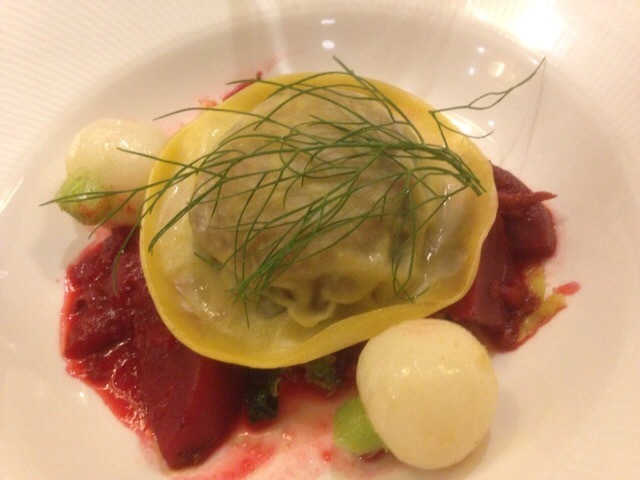 Sustainable vegetables from Worcester Produce: Opus Source Vegetarian Dinner. Bar Opus beer is a real Peaky Blinder. 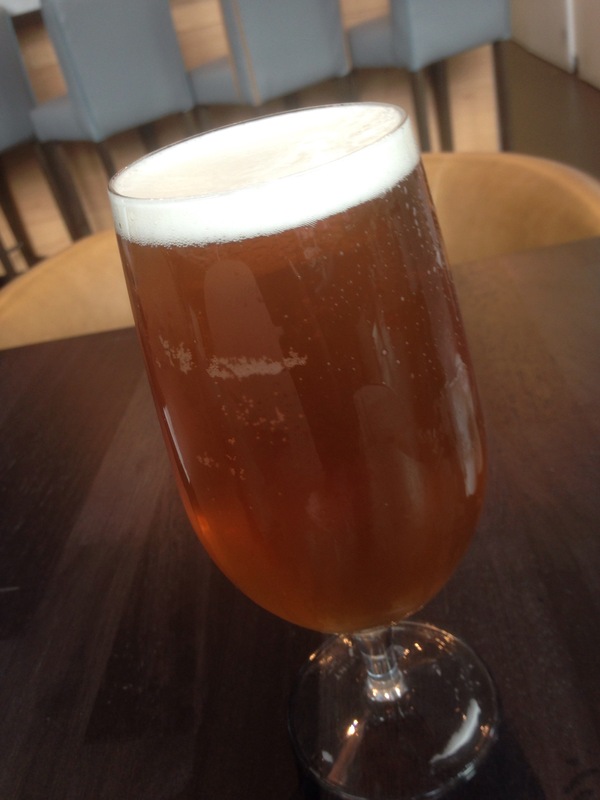 Bar Opus at One Snowhill is raising a glass to the Peaky Blinders by being the first ever bar to sell Peaky Blinders Gold, a soft and fruity ale created by Stourbridge based Sadler’s Brewery. 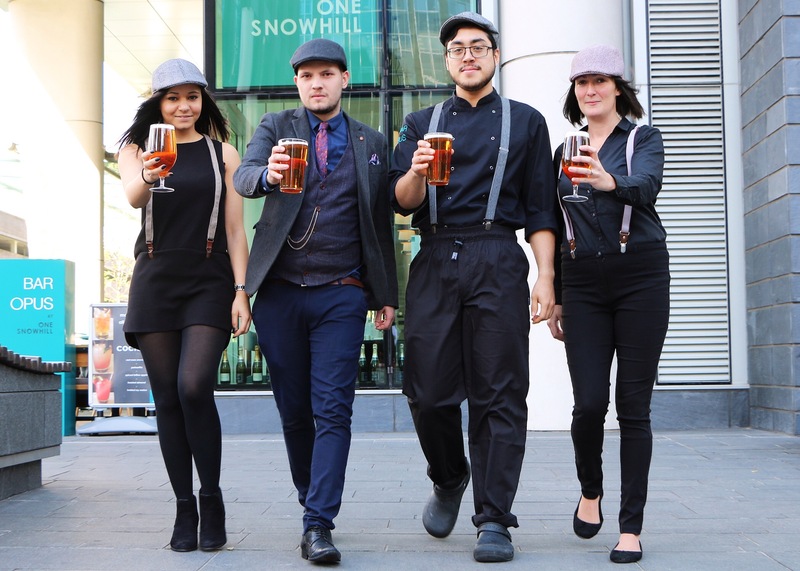 City-centre Bar Opus at One Snowhill, is to give punters a taste of the hit, period-gangster TV show, Peaky Blinders, by selling the beer on draught for the first time ever at the contemporary bar. Created and brewed by Black Country-based Sadler’s Brewery, the 4.3% ABV golden beer is a more modern, crisp version of the first beer Sadler’s created at Steven Knight’s request, ‘Peaky Blinders Black IPA’, which launched in April 2014 and recreated the taste the real Blinders would drink in the 1920s. The Peaky Blinders Gold Is also Vegetarian friendly. 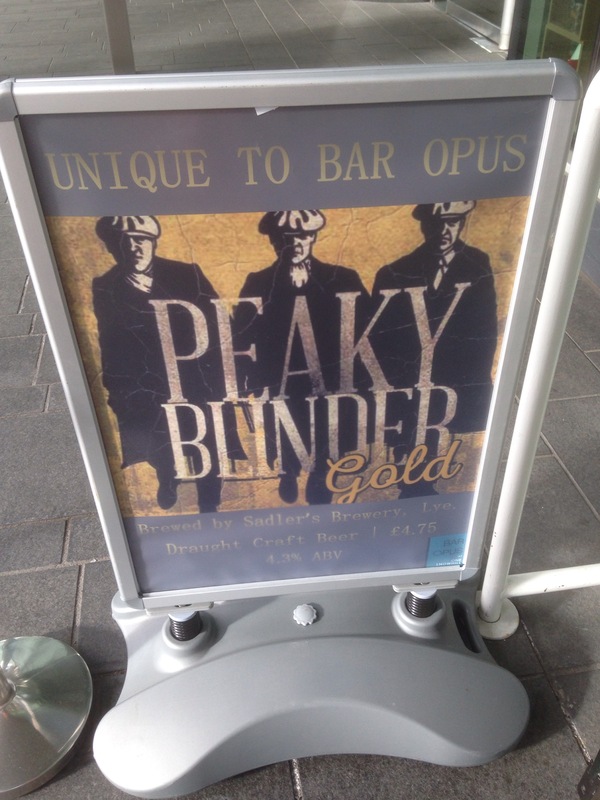 Sam Cross, manager at Bar Opus, said: “As a huge fan of Peaky Blinders, and with it currently being filmed at the Black Country Living Museum, what better way to celebrate than by being the first bar to ever sell Peaky Blinders Gold on draught. 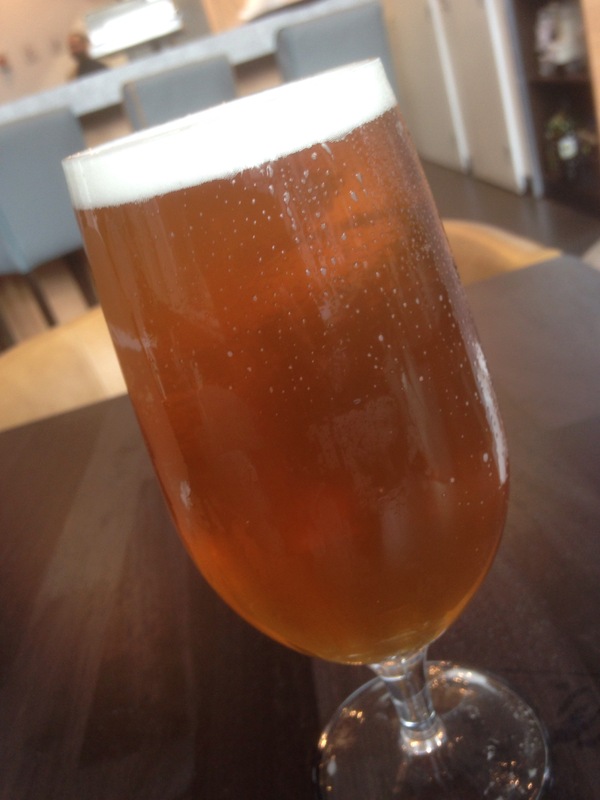 A flavoursome craft beer, its lighter taste is the perfect partner to dishes on our autumn menu. When I tried the beer I unfortunately didn’t try it with the food menu, but suffice to say it works on its own too. 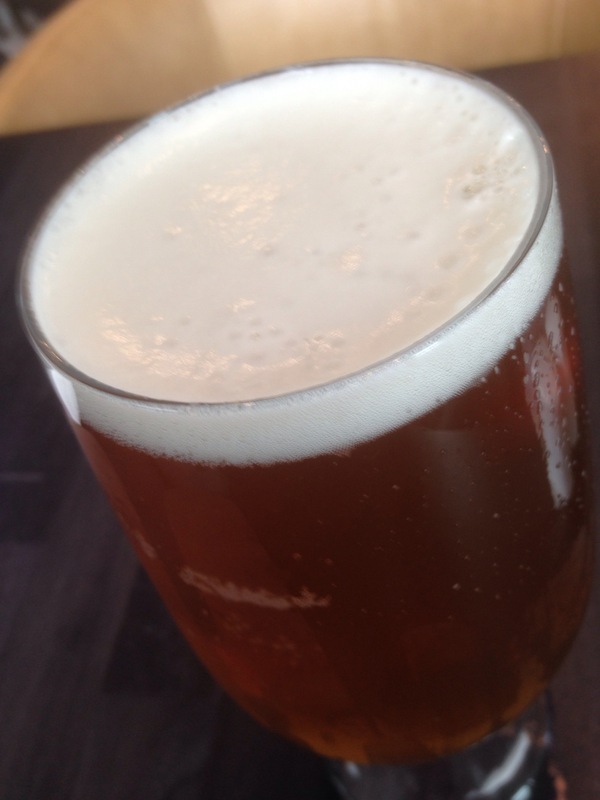 It’s golden and crisp and is quite easy drinking but very subtle in its fruity flavours. 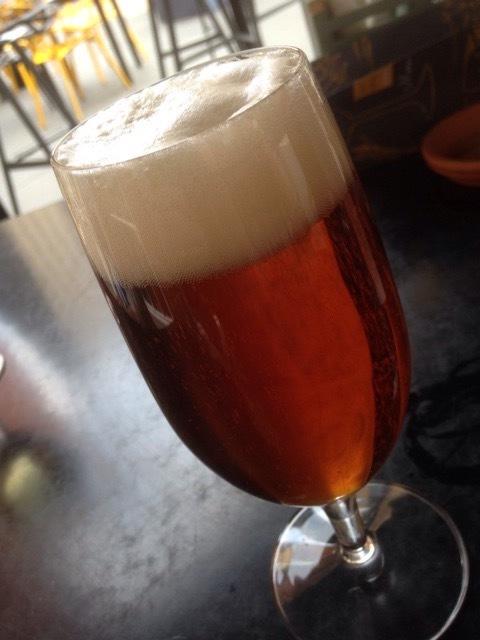 I loved the beer and it also looks the part in the glass. Here’s hoping that Tommy Shelby and the gang have a night off from The Garrison and pop down here to give it a try. 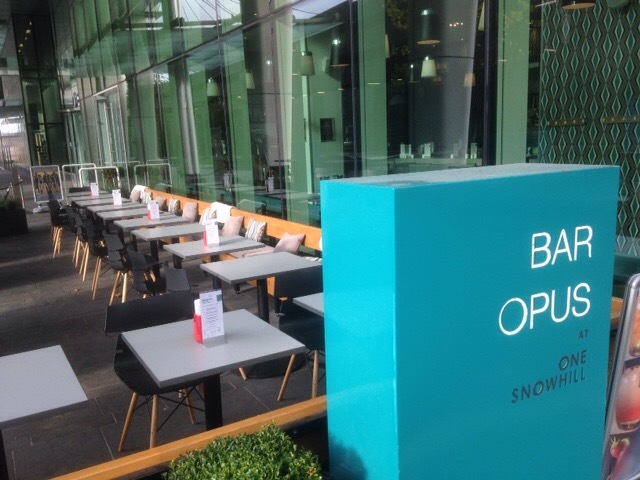 Peaky Blinders Gold draught craft beer is now available at Bar Opus at One Snowhill. 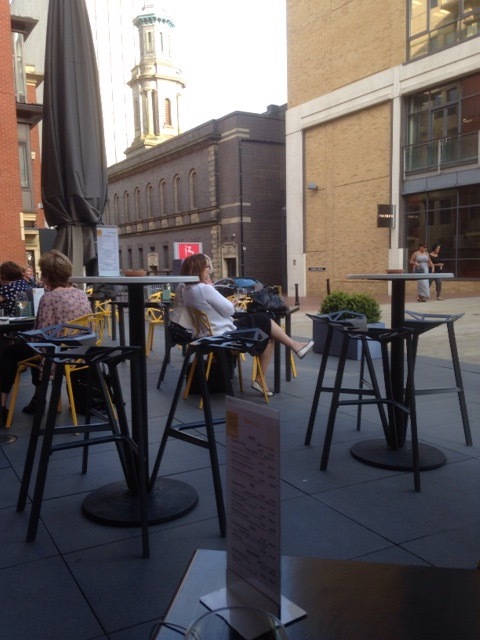 Cafe Opus is located in the Brindley Place part of Birmingham City Centre at the acclaimed modern art Ikon Gallery on Delightful Oozells square. 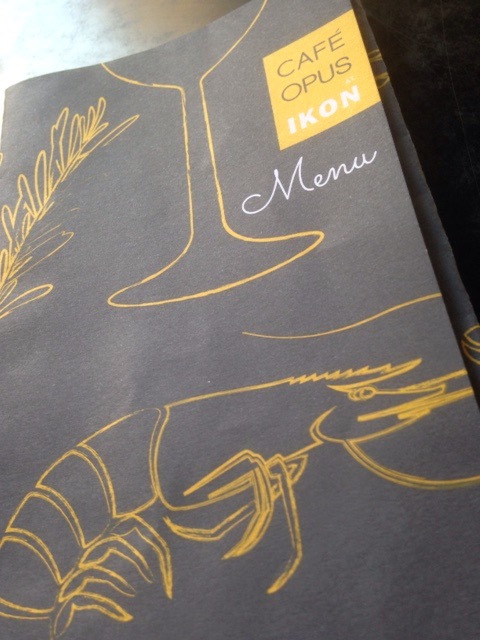 It’s a stylish, modern British cafe on the ground floor of the Ikon Gallery building with a tempting outdoor terrace that begs for sunny days and nights and is perfect for their informal menu that’s designed to let you eat what you fancy when you fancy it. 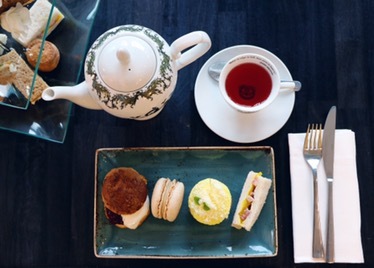 Serving cafe classics, afternoon tea, fine beers, wines and coffee, at reasonable cafe prices. 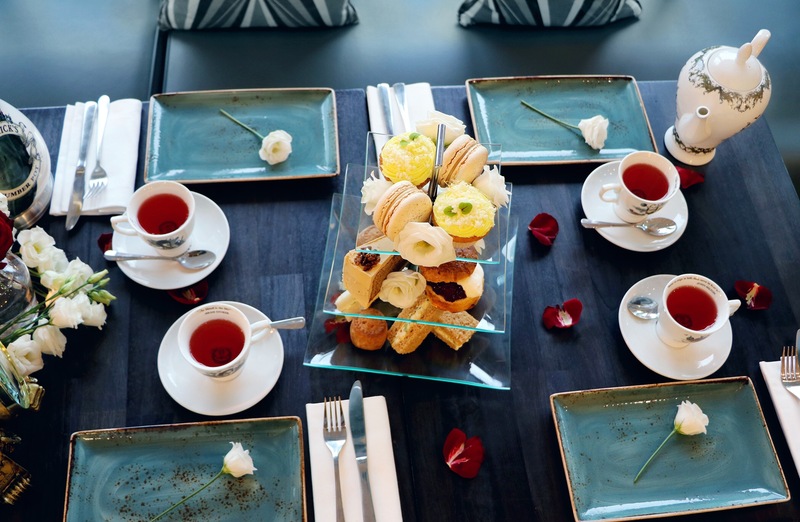 The true taste of Cafe Opus is that they are independent and source their produce locally and ethically, knowing all of their producers, farmers and fishermen. It’s all about utilising fresh produce and allowing the simplest of ingredients to shine through. 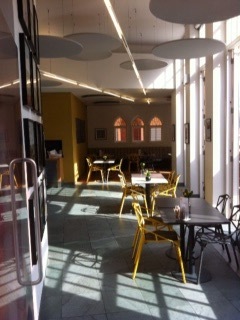 In fact I think the summer months are the best time to visit Cafe Opus. The terrace itself demands it, and the produce, well speaks for itself. 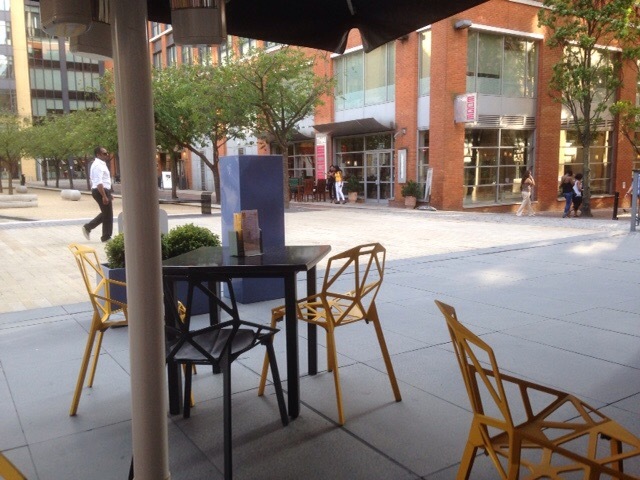 Ruth and I have have always loved visiting Cafe Opus on a Summer evening and thus couldn’t resist the recent good weather. We chose a Friday evening partly because Ruth wanted to try out the steak on ‘steak friday’ and because they were running what’s called ‘Come Vinyl With Me’. Now, this is where you can bring your own records and be a DJ by serving up three courses of musical delights in 10 minutes. This is strictly vinyl, but is very eclectic music wise and was good fun. At least our dinner was accompanied by a decent soundtrack. We didn’t bring any records ourselves on this occasion, but you never know in the future. This is held on the first Friday of the month. So there we had it, good music and maybe good food. 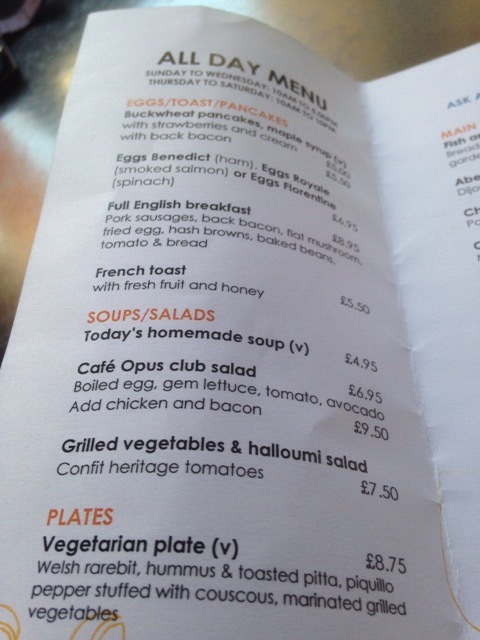 Having visited Cafe Opus before to eat on many occasions I knew the Vegetarian Dishes were always diverse and thoughtful. So that’s me satisfied too! We did sit on the terrace, and ordered a local Langley’s Gin and tonic (1724) for me and a glass of white wine for Ruth. 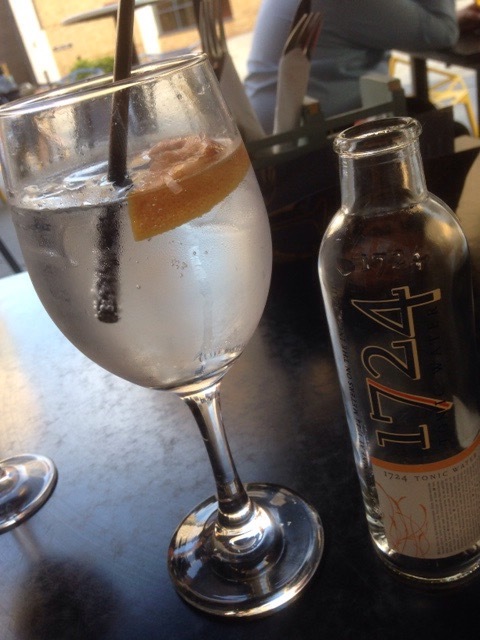 The gin and tonic was lovely, perfect on a summers alfesco night. 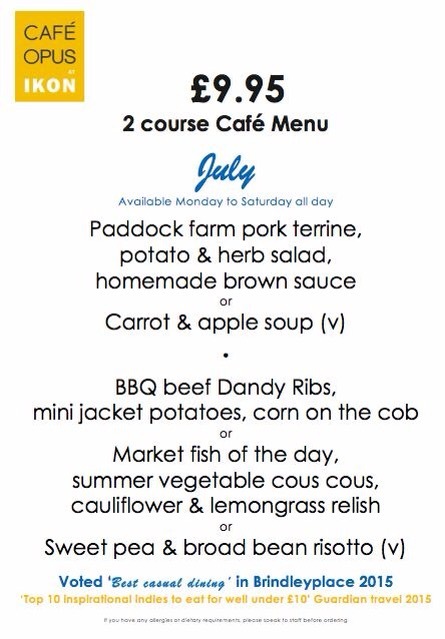 It’s the informality of the menu that makes Cafe Opus the ideal Summer venue. 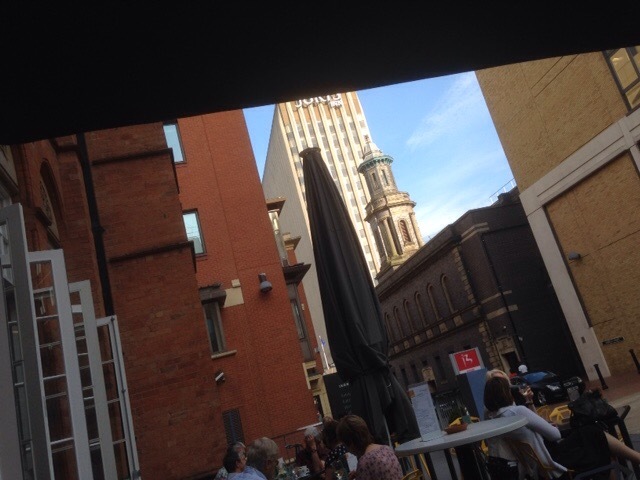 The food feels relaxed, continental and I always feel sitting on the terrace whatever time of the day that Birmingham is some far flung city not just home and familiar. For that reason I chose The Vegetarian Plate from the all day menu. 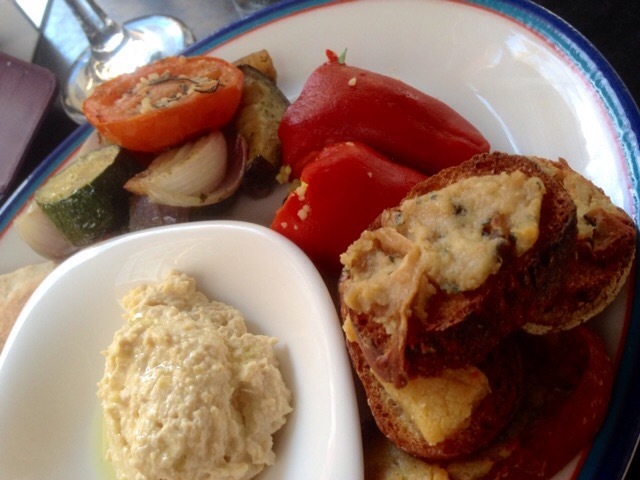 Comprising of Welsh rarebit, hummus, and toasted pitta, piquillo pepper stuffed with couscous, marinated grilled vegetables. All of the elements were excellent, nothing was out of place. 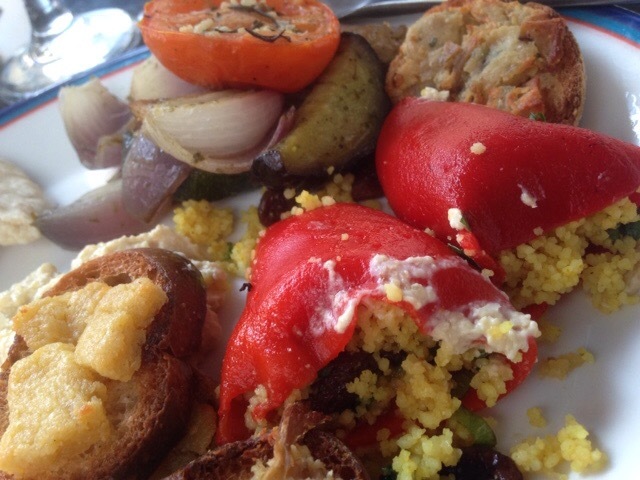 The Piquillo peppers were the stars though, the contrasting flavour of the pepper with the slightly spicy couscous was summer in itself and reminded me of some lovely tapas meals in Spain. The Rarebit, with a good string cheese flavour was excellent too and the marinated vegetables (courgettes, aubergines) delicious. It was a good plate of food, though simple it was a good example of how informal dishes can be uplifting if the ingredients are fresh and well cooked. 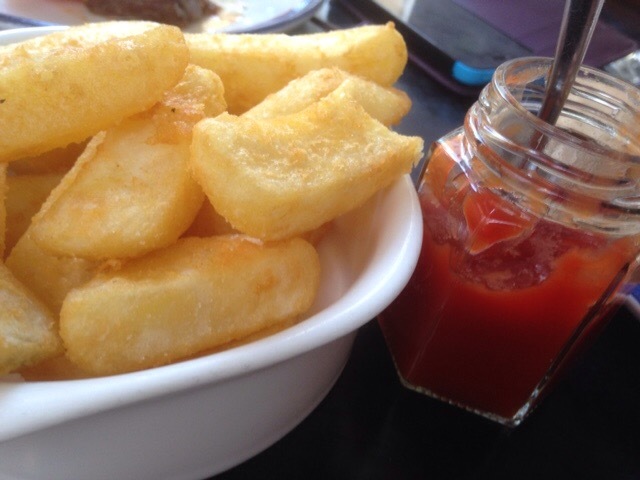 I also ordered some fat chips which were delightful and went well with the vegetarian plate. Ruth surfice to say loved her steak aged for 28 days to ensure their succulent flavour it appeared to work. She was happy. We ordered another 2 glass of wine and a Chapel Down brewery Curious IPA and Lager (from the winery in Kent that makes some delicious wines and some nifty Sparkling brut too). 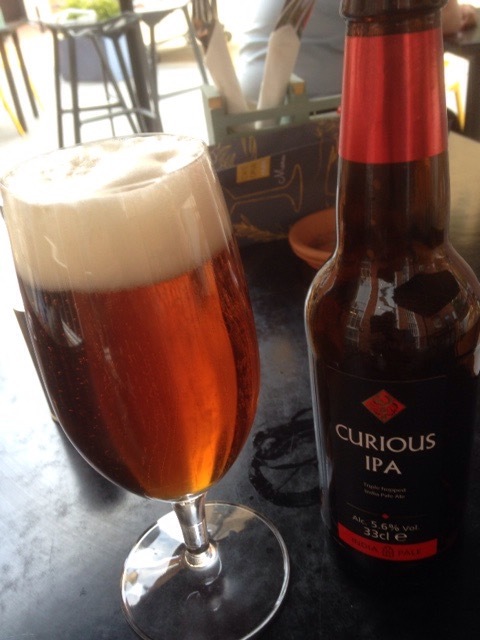 The IPA a powerful but hoppy Indian Pale Ale. Very drinkable, very flavourful. Lovely in the sunshine. We were both happy to order puddings too. Ruth ordered a lemon posset, fresh raspberries which was very nice. Fresh, summery and quite light. No picture I’m afraid as she started before I could take one. 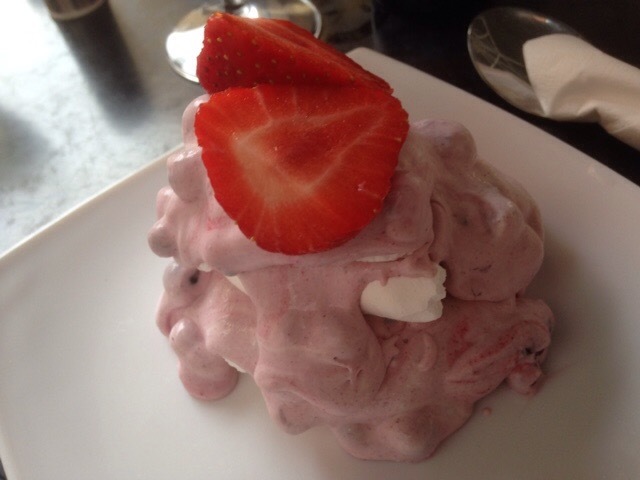 I ordered the Mixed Summer berry pavlova. 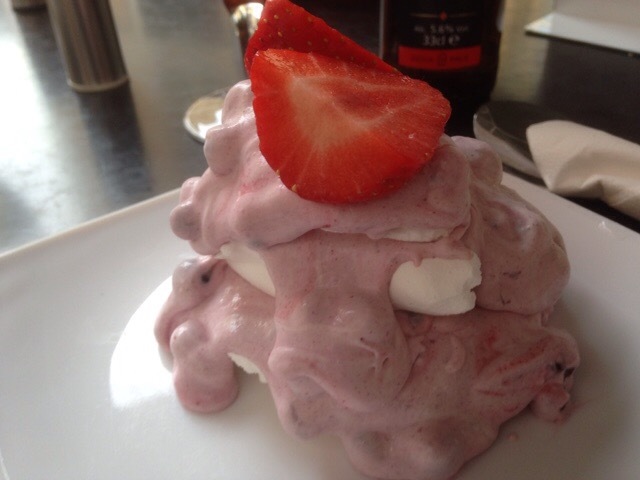 The combinations of meringue, cream and strawberries and raspberries worked well. Though it was quite creamy in texture it didn’t feel heavy, but was light was a subtle meringue crunch. A well made and enjoyable pudding. 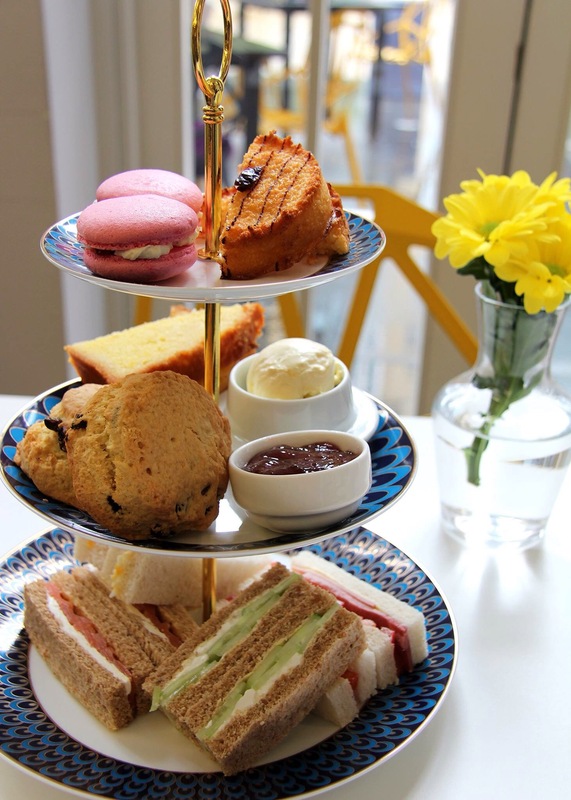 Cafe Opus is a lovely spot for a light summery dinner or lunch or afternoon tea. 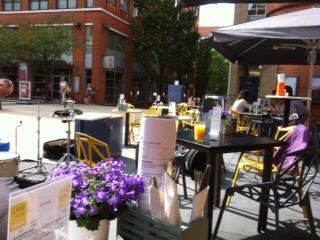 If the weather is fine, the terrace is a super spot to people watch and to take in those sunny Rays. The food, been seasonal is of the highest quality, fresh, well made. Cafe Opus do the simple things delightfully well. The dishes are well cooked, the Vegetarian dishes are thoughtful, not just an add on ( though could do with a few more, maybe specials?) and with the seasonal aspect feels modern and interesting. 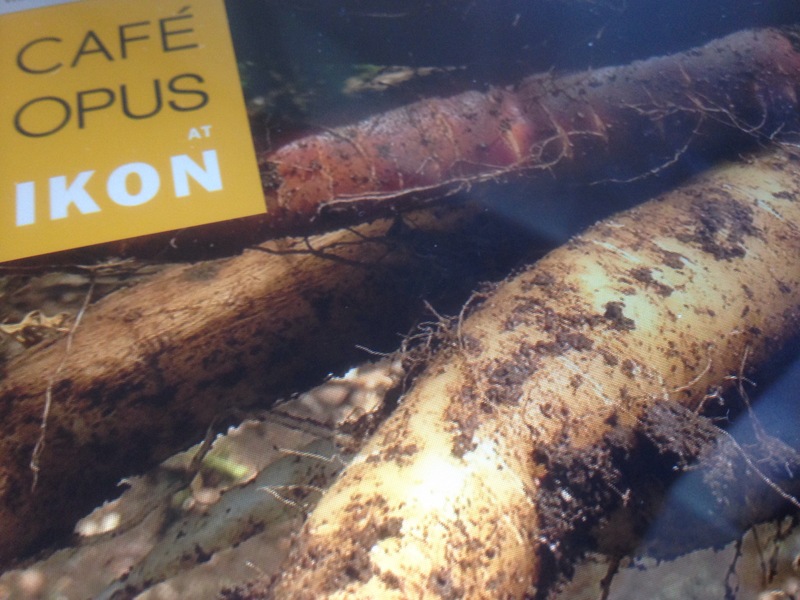 They are more cafe orientated than fine dining, but that simple nature works well. The menus are affordable and the service was good throughout. Cafe Opus is well worth a visit for an ethical slice of artistic Birmingham whether after, before or separate from a gallery visit. 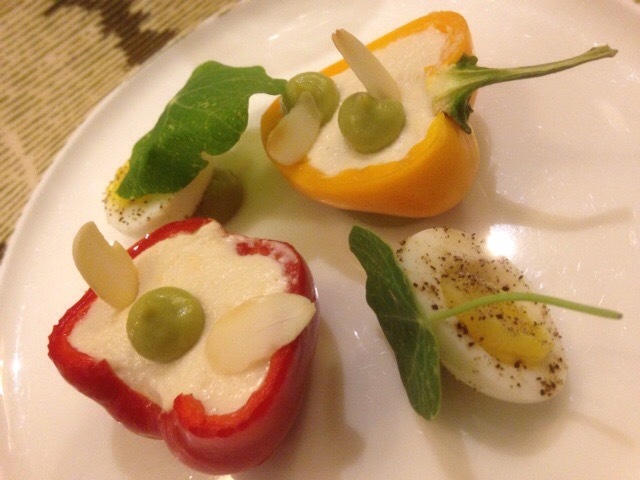 There’s a lot to like about Cafe Opus. It’s got so much right. Now when’s my next visit? 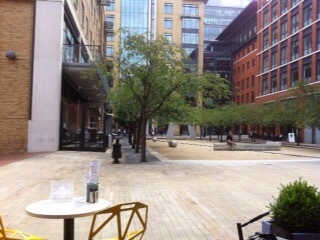 Cafe Opus at Ikon, 1 Oozells Square, Brindley Place, Birmingham, B1 2HS. 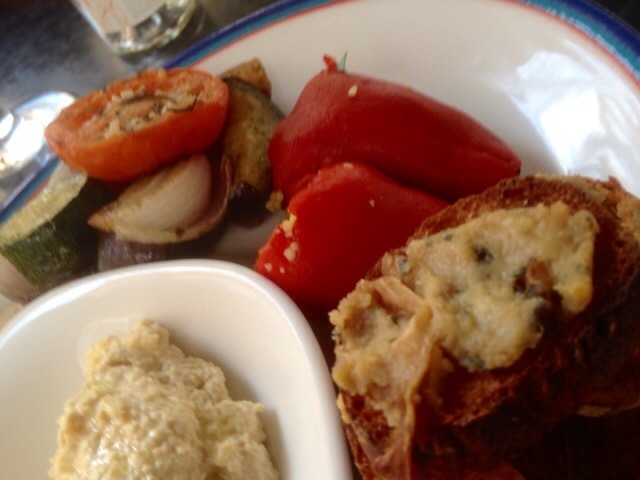 Meat Free Monday: every Monday at Cafe Opus, daily vegetarian specials. Day time only. 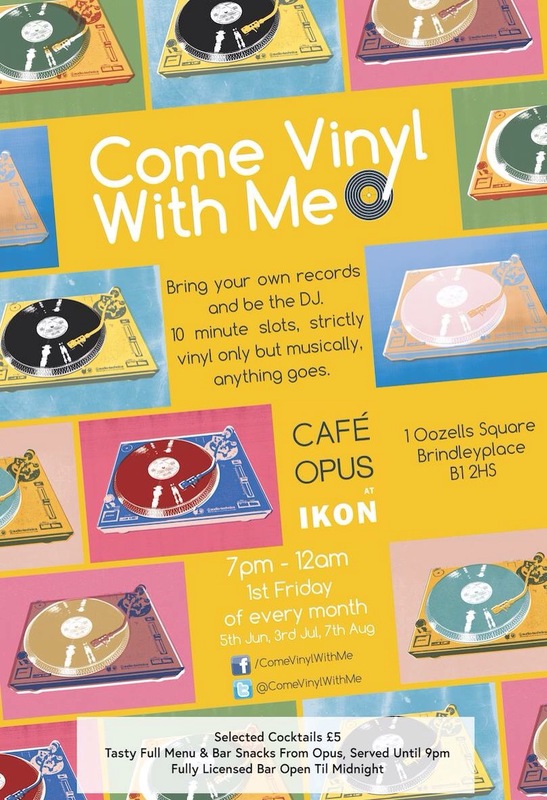 Come Vinyl with me at Cafe Opus. You can also receive 2-1 on all breakfast menu items until 12pm (Monday-Friday) or 10% off the bill (all day all week) with the Independent Birmingham card. See link to purchase the IB card. We received our food at Cafe Opus complimentary, but paid for our drinks. All of my opinions are my own and my review is honest and without bias as always. I was not required to write a positive review.